Ghouta (Arabic: غوطة دمشق‎ / ALA-LC: Ghūṭat Dimashq) is a countryside and suburban area in southwestern Syria that surrounds the city of Damascus along its eastern and southern rim. Historically, the area developed as an oasis formed by the Barada river around the site where Damascus was founded. The Arab geographer, Al-Muqaddasi (d. 991), mentions al-Ghouta as being one of the six rural territories belonging to the District of Damascus. Since ancient times, canals dug by Damascenes provided irrigation of land on either side of the Barada, increasing the size of the Ghouta to the south and east of the city. Separating the city from the dry grasslands bordering the Syrian Desert, the Ghouta has historically provided its inhabitants with a variety of cereals, vegetables and fruits. Eventually the irrigated agricultural area in the Damascus countryside reached a size of 370 square kilometers (140 sq mi). 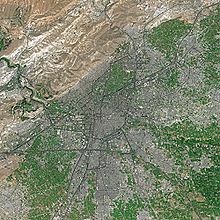 In the 1980s, urban growth from Damascus started replacing agricultural use with housing and industry, shrinking the green zone. Before the Syrian Civil War, the area was home to about two million people, but in 2017 the population was estimated to be about 400,000. During the civil unrest that began in Syria in March 2011, some eastern Ghouta residents joined the protests against Syrian president Bashar Al-Assad and joined the Syrian rebels, expelling Syrian government forces by November 2012. In February 2013, Syrian rebels captured parts of the ring road on the edge of Damascus and entered the Jobar district of the capital city. Backed by and Hezbollah, the Syrian Arab Army counterattacked and in May 2013 began a siege of Eastern Ghouta. In mid-2017, the main rebel faction in the area was Jaysh al-Islam, based in Douma (with an estimated 10-15,000 fighters in the region in early 2018). The second largest was Faylaq al-Rahman, an official affiliate of the Free Syrian Army (FSA), controlling much of central and western parts of Ghouta, including the Jobar and Ain Terma districts. Ahrar al-Sham (based in Harasta) and Tahrir al-Sham (HTS - controlling smaller districts such as Arbin, al-Ashari and Bait Naim, with an estimated strength in the area of 500 in February 2018) had a far smaller presence. The residents described the life under the control of Islamist rebels as "hell" to a Channel 4 correspondent as they were forcibly conscripted, prevented from leaving and had no water and electricity. In February 2018, the Syrian army launched an operation to dislodge rebels from the area. In early March 2018, the Syrian army had captured 59% of the Eastern Ghouta pocket. On 7 April 2018, at least 48 people were reportedly killed in a chemical attack in Douma, which resulted in an armed response from the United States, France, and the United Kingdom.On 14 April 2018, the Syrian Army officially declared Eastern Ghouta to be free of militants, securing it under government control. ^ "Damascus - Landscape - City site". Encyclopædia Britannica. Retrieved 21 May 2015. ^ Al Zoughbi, Samira (2005). "An Analysis of Agriculture-Environment Interactions and Policy Options for Sustainable Agriculture in Eastern Al Ghouta (Syria)" (PDF). Farming Systems and Poverty: Making a Difference -- Proceedings of the 18th International Symposium of the International Farming Systems Association: A Global Learning Opportunity. Food and Agriculture Organization of the United Nations. p. 31. Retrieved 17 February 2016. ^ Collelo, Thomas, ed. (1988). "Land, Water, and Climate". Syria: a country study. Federal Research Division, Library of Congress. LCCN 87600488. ^ Alsaafin, Linah (6 February 2015). "Syria's Eastern Ghouta: the latest casualty of war". Middle East Eye. Retrieved 18 February 2016. ^ Almohibany, Amer (22 October 2017). "In Syria region under regime siege, children die of hunger". France 24. Retrieved 23 October 2017. ^ "Damascus on Edge as War Seeps into Syrian Capital". New York Times. 10 February 2013. ^ Loveluck, Louiusa. "Dozens killed in apparent chemical weapons attack on civilians in eastern Ghouta — rescue workers". Washington Post. Fred Ryan. Retrieved 8 April 2018. ^ "Syrian army announces eastern Ghouta free of militants: state media". Reuters. 14 April 2018. "Damascus, Syria : Image of the Day". NASA. 26 June 2013. Satellite image of wider region showing 2013 green areas.